I am a disciple of Tim Hale who in my humble opinion is the investing granddaddy for UK investors. From the emails I receive it’s rare that I can’t refer a reader to his book Smarter Investing: Simpler Decisions for Better Results for the answer to their question. 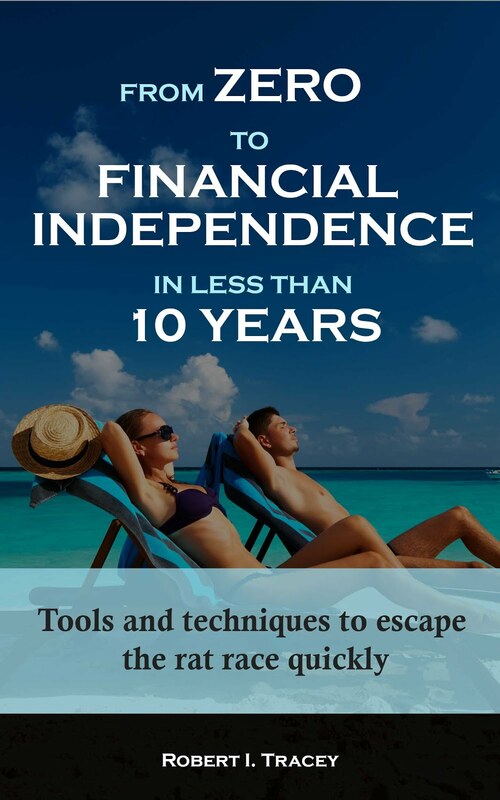 It’s a must read for anyone serious about investing from the UK. I followed this guidance with no other exposure to UK Equities other than the All Share until late 2011 when I realised, that for me at least, I wanted more dividends than my strategy was forecast to give me at the end of my accumulation stage. 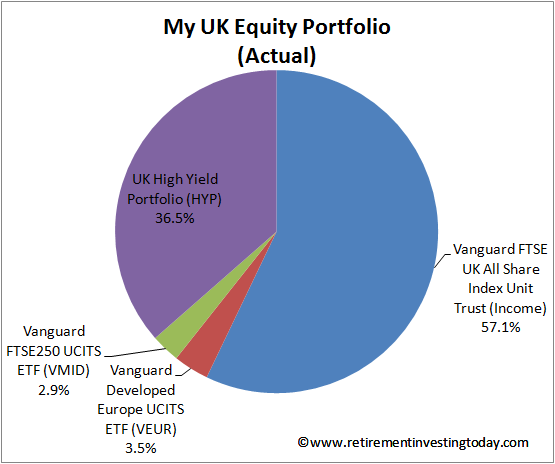 I therefore started to diversify a percentage away from Level UK Equities towards a UK based High Yield Portfolio (HYP). Today that HYP contains 17 companies with 83% of them by valuation coming from the FTSE100 and 16% coming from the FTSE250. I then continued with this strategy until I reached the point where it looked like my total portfolio would enable me to live off the dividends. I’m fairly comfortably there now and so don’t need to keep growing my dividends at such a great rate. With £178,000 now invested in both the FTSE All Share Index and my HYP I feel it’s now time to further diversify what I’m invested in from a “UK Domestic Equity” perspective. To do this I’m going to take a step back for a second and look at the whole UK market. The London Stock Exchange currently has 2,339 companies listed on both its AIM and Main stock markets with a market capitalisation of £3,821 Billion. Many of these will of course generate some or all of their earnings from overseas and only 1,576 of them are incorporated in Great Britain. Given the point in my investing journey I find myself I have no need to invest in ‘ten bagger’ or ‘penny’ stocks. I’m therefore going to restrict myself to shares that can also make it into the FTSE Indices which as a criteria includes “Only Premium Listed Equity Shares, as defined by the Financial Conduct Authority in its Listing Rules Sourcebook, which have been admitted to trading to the London Stock Exchange with a Sterling denominated price on SETS are eligible for inclusion in the FTSE UK Index Series.” I show these 901 companies in the chart below categorised into their FTSE Indices vs a total Market Capitalisation of £2,048 Billion. - 2% (£42 Billion) remains via 258 companies. Thanks for highlighting Stockopedia but definitely no intention to start picking shares (other than potentially the odd HYP share but I already have criteria for them). For me now it's low cost index trackers (and cash for a home) all the way to FIRE. Great post - Tim Hale is a top guy indeed. I'm a big fan of the FTSE250 and am also looking to increase my exposure to these (slightly) smaller companies - well they're not really small at all, are they?! I have realised that our house is a large part of our wealth, and may well be required to pay for my widow's stay in a care home. So logically we should invest our financial assets in something that might reasonably be hoped not to correlate too much with UK property i.e. not UK equities. Similarly we should diversify away from HMG's State Pension by not buying gilts - no point being over-exposed to Treasury turmoil. I'm not sure how to diversify the risks in our final salary pensions. Again, we should aim to avoid investing in those local industries whose flourishing supports our house price. So we should avoid "tech" and pharma/biomedical companies. I'm not sure I'm with you there dearieme and I hope you're just being sarcastic? Personally, I think of it as you need somewhere to live and so I d/won't even count my home in my wealth. That said I don't see much of a correlation between UK house prices and UK shares. The FTSE100 gain wise (appreciate divi's have been paid) has gone nowhere since 2000 while UK average house prices have gone to moon. In line with Hale you also need Level 1 Equities. Re the State Pension. As you know I'm not planning on any (but will buy Class 3 as an insurance policy in FIRE) but thinking aloud. Is there really a correlation between State Pension (with a triple lock) and gilts? Additionally, I haven't researched it but maybe look at somewhere like Argentina for the extreme black swan. Did they stop paying welfare when they defaulted? Of course we all have to DYOR. "I think of it as you need somewhere to live and so I d/won't even count my home in my wealth." The local authority will think of it as wealth when one of you needs "care". If either or both of you need "care" then it will have to be funded somehow. What better than sale of a house which, by assumption, the latter of you to enter "care" will no longer need? I've got Tim Hale's book from the library, and my 2 actions from it so far are to move 20% from my FTSE 100 ETF to a FTSE 250 one. I think Vanguard ETFs for both as that's free to keep inside HL, but I might need to delay it until I've got a capital gains allowance to use. My second decision is to get 5% into Emerging markets, probably BlackRock Emerging Markets Equity Tracker, as I like having variety in supplier too to reduce risk, and as an ISA with a different broker I don't need to be in ETFs to avoid custody charges. So I'm trying to diversify by country, broker and fund manager. But I'm remaining bullish over equity, as I don't feel happy with bonds yet, as I've not researched how bond funds work yet. I'm with you on the diversify by country, broker and fund manager. Country. I admit I do have quite a bit in the UK via both my FTSE All Share/HYP/FTSE250 and UK Index Linked Gilts but my high weighting to the FTSE100 also means that quite a bit of the revenues come internationally. With me seriously considering leaving the UK I've also increased my nominal international equities target from 15% to 20%. 'Wrapper'. I've written about this before when I was transferring some wealth from an employer pension to a SIPP. I went for a new provider even though I knew it would cost me some additional annual fees. Right now my type 5 are YouInvest (SIPP) 24.6%, Hargreaves Lansdown (SIPP & Trading Account) 20.5%, TD Direct (ISA) 14.1%, NS&I 12.8% and Perpetual (a legacy mistake) 6.6%. 'Product'. Top 5 are Vanguard UK 32.8%, Direct Holdings (eg Shares) 12.8%, NS&I 12.8%, iShares 9.6%, Perpetual 6.6%. I'd like more diversification but I'm balancing that with an aim to minimise expenses. With what I have today I sleep fairly soundly but will try to rebalance further where possible over time. So in effect, once you take account for the fact that 1/6 of your HYP holdings (assuming equal weighted) are mid cap you've taken your mid cap allocation in UK equity from 16 to about 18.5%. Or in terms of the whole portfolio from 3.5% to 4%. I am sure this is sensible pruning but I don't think it does huge amounts for overall diversification. - ISA contribution each month. Once it builds to £4k or so in cash I buy FTSE250 via VMID. The £4k is to just keep trading costs sensible. - Remaining savings outside ISA goes to Cash for home purchase. - Vast majority of Pension contribution goes to International (Europe and Japan currently) and EM Equities with a little to UK Property and Index Linked Gilts. I'm making fairly large monthly contributions and so I have found in the past that I can passively rebalance pretty quickly with new money and dividends. Do you have a target %? I've seen people throw everything into FTSE 250 instead of All Share (650) and that has some merit. Personally, I use All Share and a hefty relative Small Cap tilt (Tim Hale's suggestion), but I sometimes wonder if I should just replace both with a 250. Is that what you are targeting, on a new money basis? I'm all for target percentages (it's what a lot of this blog is about) but for this one given my closeness to FIRE I might not need to worry about it. I'd like to say about 25% at maturity but more work needed before I settle on a target. We know the FTSE250 yields less than the FTSE100/All Share and one thing I am big on is living off the dividends with dividends greater than spending at FIRE to enable a cash buffer to be built for the 'bad times'. I'd be interested to know how you are getting access to Small Cap tilt as that's my next point of call after the FTSE250 builds a little? 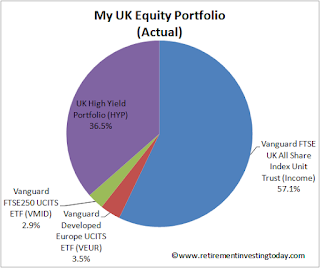 Vanguard has a Global Small Cap fund (but its OCF is a hefty 0.38%) but no UK Small Cap. In the 1st edition Hale suggested somewhere between 5-10% depending on portfolio need and I'd go for something like that. Of course they yield even less than the 100/250. How much are you tilting by? I have a portfolio that looks like hale's portfolio number 4 (2nd edition) with a few tweaks (no commodities, less home bias). Here you take you your UK equity exposure and put 20% to Small and 20% to Value and leave 60% in the broad index. Do the same with International. The 0.38% OCF vanguard fund is the one I use. 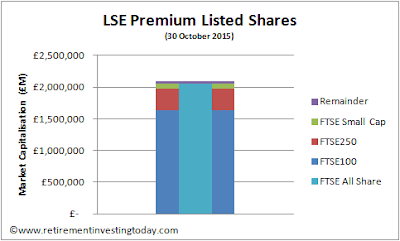 Domestically I use ISHARES MSCI UK SMALL CAP UCITS ETF which has an unfortunate OCF of 0.58%. My total equity OCF is 0.23%. Thanks for that. I'd baulk a bit at that 0.58% OCF - that sounds like a lot for a tracker in this day and age. Maybe I need to reconsider to get the exposure. My total portfolio expenses are currently 0.27% but that's weighed down by an early Australian Equities mistake which I can now only correct gradually as well as an expensive company pension scheme which I'll now be transferring every 12 months or so. yes to make it worse the ishares tracker holds the bottom 14% of the market, so its more mid cap than small. I shall reconsider whether I should just hold a 250 tracker at 1/3 the cost. sadly there still doesn't seem to be a cheaper or good uk small cap tracker out there. i guess thats more evidence for using 250, just as your post was targeted. XXSC.L at 0.4% is a Europe small cap ETF. It has been my overall best performing tracker in recent times. RIT, what is your ongoing Japan investment, please? After reading Tim Hale's book just over a year ago, I've been aiming for my own portfolio for all seasons for my funds. It's a little riskier than as recommended by Hale (less in gilts/bonds)but it's given me something to aim for and I'll review in a few years time. Good luck with VMID. 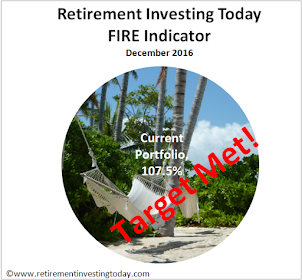 I recently transferred a private pension into a SIPP and will be investing in a few ETFs. Unfortunately, VMID isn't available as a regular investment with my provider so I've gone for the HSBC equivalent. I can't but help notice a big home bias in your investments. I might have missed this in a previous post but is there a reason why you haven't diversified into the global market (aside the the 3.5% in Developed Europe)? Possibly to keep RIT's overall charges low. It is difficult to invest globally cheaply, even more so if you do not want 50% of your global investment to be USA. I recall looking at how to track small caps a few years ago, possibly after reading Hale's book. I think the 250, more or less, tracked the returns of the MSCI Global Small cap index, so it may be a good proxy for global small caps but with a lower charge. I am tempted by the Vanguard fund as I want to get greater exposure to North American small caps. I use the Vanguard 60/40 Lifestrategy fund amongst others and think these funds are a great one stop for most investors. Highly recommended.